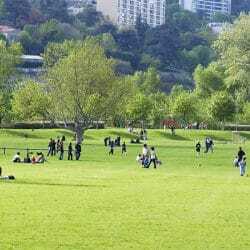 A large urban park and lake for outdoor activities on the outskirts of Lyon. The grand parc de Miribel-Jonage is an urban park covering almost 2,200 hectares on the outskirts of Lyon and offers a multitude of outdoor activities for adults and children alike including mountain biking, golf, tennis, badminton, sailing, kayaking, beaches, swimming, fishing or simply a nice walk in the woods with a picnic. The park also hosts many events including the Woodstower Music Festival in August. The island was created in the 19th century by the digging of the Miribel and Jonage canals to help control any potential flooding of the Rhône. 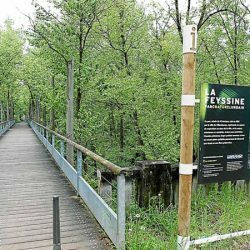 In 1968 the creation of the organisation Symalim allowed further development of the park to produce a beautiful area of preserved nature just a few kilometres northeast of the city with the possibility of numerous activities linked to the large lake. Grand Parc Miribel-Jonage public beach. The park offers an impressive list of activities for adults and children with the possibility of reasonably priced rentals of any equipment you might need. The park has dozens of kilometres of easy bike trails suitable for all levels and whether exploring the more wild areas or simply cycling around the lake you’ll never run out of interesting places to discover. There’s a 9 hole golf course and driving range, tennis and badminton courts and lessons and various membership options are available for all activities. 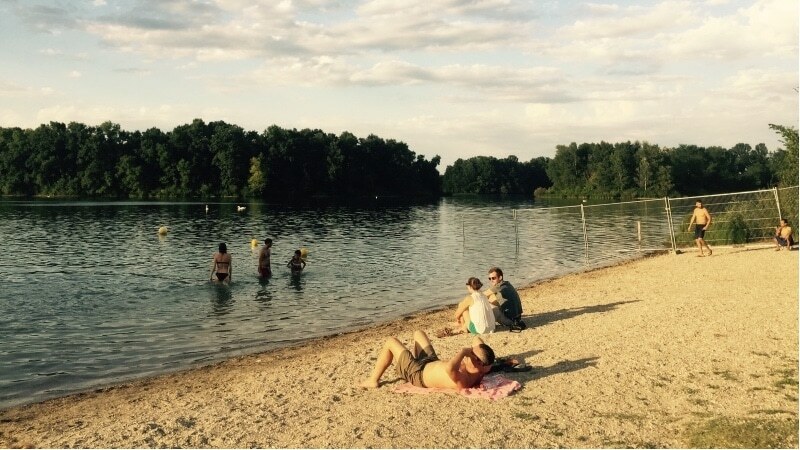 Perfect for hot summer days are Miribel’s 4 beaches, complete with lifeguards, lounge chairs, volley ball courts, play areas for children, showers, changing rooms and anything you might need for your beach vacation on the edge of the shimmering lake. You’ll quickly forget you’re only a few minutes from the city centre of Lyon. If you’re feeling more active then there are sailboats for hire as well as paddle boards, kayaks, rowing, fishing and even “aquabulles”, if you fancy walking on the water inside a giant clear plastic sphere. A veritable plethora of aquatic activities and all the equipment, advice and lessons should you need them are available. If you’re in the mood for something more relaxing on the water then take a boat cruise on the lake with the Navette du Canal. There are plenty of refreshments available with a choice of 7 restaurants and snack bars in the park offering everything from a quick bite to a 3 course meal. The park is open all year round although some activities are seasonal. Please check the website for details. By car follow the A42 towards Geneva and take exit #4 Parc de Miribel Jonage or from the Rocade Est take exit #5 Parc de Miribel. There is a bus service (TCL #83) between April and September leaving from metro station Vaulx-en-Velin and the park is linked to the cycle paths of Parc de la Tete d’Or and Gerland via la Doua and Porte Croix-Luizet.